There was some very exciting news announced at the Clunes Farmers Market in July. The Clunes Farmers Market won a grant for $27,000 from Regional Development Victoria and Hepburn Shire for the purpose of expanding the farmers market. The grant was announced at the July market to a very receptive market crowd including stallholders, local traders and customers. VIPs in attendance were Danielle Green, MP, Aaron van Egmond, CEO, Hepburn Shire, Neil Newitt, Mayor Hepburn Shire and Natalie Hardy Hurst, Vice Chair Clunes Farmers Market. Speeches were made by all of the above. The funds are to be spent on hiring a marketing consultant to formulate a marketing plan; an advertising and promotional budget, purchase of a large marquee, trailer, chairs and tables and cooking stations to enable special events to be held. "The grants are a welcome addition to enable the Clunes Farmers Market to expand and grow the excellent reputation for quality farm fresh food that the market already has" stated Leanne Kamp. 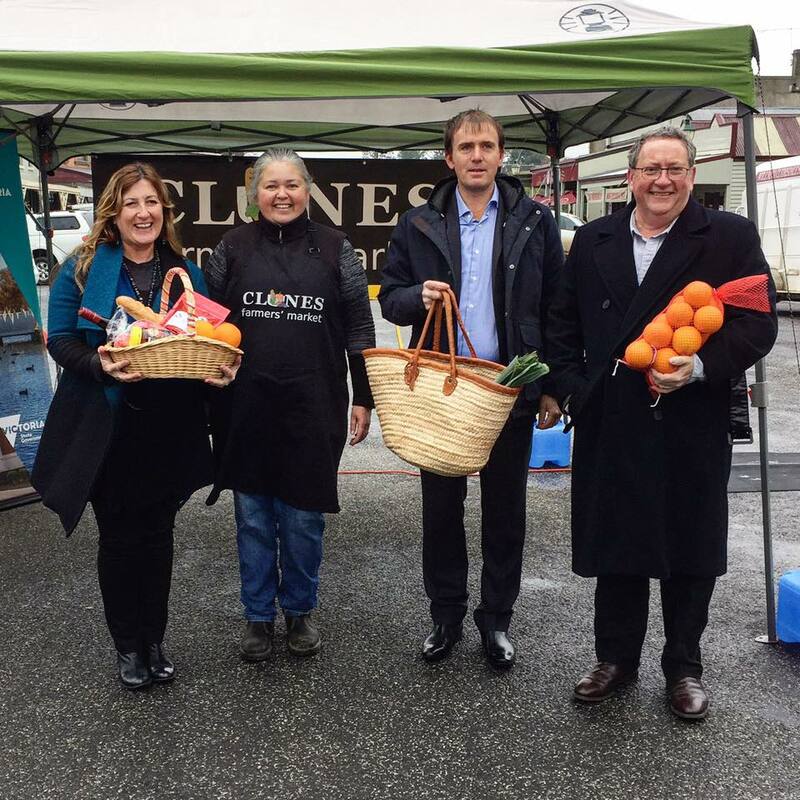 "We are really excited about the future of the Clunes Farmers Market as this grant enables us to introduce exciting new activities to the market including feature chefs, cooking competitions and tastings." L-R: Daniele Green MP, Secretary for Tourism, Major Events and Regional Victoria, Natalie Hardy Hurst, Vice Chair Clunes Farmers' Market, Aaron van Egmond CEO Hepburn Shire & Mayor Cr Neil Newitt. Photo supplied.